Buckinghamshire students who came up with ideas for electric vehicle charging lanes and cars with built-in breathalysers are amongst the winners of the Bosch Smart Future Challenge announced by Bosch UK President, Steffen Hoffmann, at a prize-giving ceremony. The global technology company, which has its UK headquarters in the Buckinghamshire town of Denham, provided feedback to all 140 students who took part in the Smart Future Challenge at St. Michael’s Catholic School in High Wycombe. The teams of Year 10 students had to identify two mobility issues in their local area, and come up with two solutions to solve them. The students demonstrated their creativity, presentation, problem-solving and team-building skills, and learnt how they could solve real-life problems in their local area. Aquatak, who proposed electric vehicle charging lanes on motorways and major roads, which use sensors and cameras to recognise relevant vehicles, to address climate change issues. COUP, who came up with the idea of creating an app to tackle pollution. iDos, who identified the issue of accidents caused by drink driving, proposing solutions including a breathalyser built-in to cars, where vehicles would ask competency questions of drivers to assess intoxication levels. Prizes include an exclusive screening at a world-renowned local film studio and ten work-experience placements at Bosch UK’s headquarters in Denham. Also for taking part, Bosch will donate £500 to St. Michael’s Catholic School, for future STEM related initiatives. As a local employer, Bosch designed the challenge with the help of the Buckinghamshire Skills Hub. The challenge aimed to raise students’ aspirations towards a career which uses these skills to address real world issues, and give students a broader understanding of the opportunities that a career in STEM can offer, outside of the stereotypical roles often associated with these subjects. The students presented their ideas in five minute slots to the whole year group and a panel of judges, including Dominic Grantley-Smith, STEM Ambassador Liaison Officer in Buckinghamshire; Marina Jackson, Under-19 Skills Manager at Buckinghamshire Thames Valley Local Enterprise Partnership; Bruce Bradley, Enterprise Adviser to the school, and Lauren Finnigan, Communications Manager at Bosch UK. 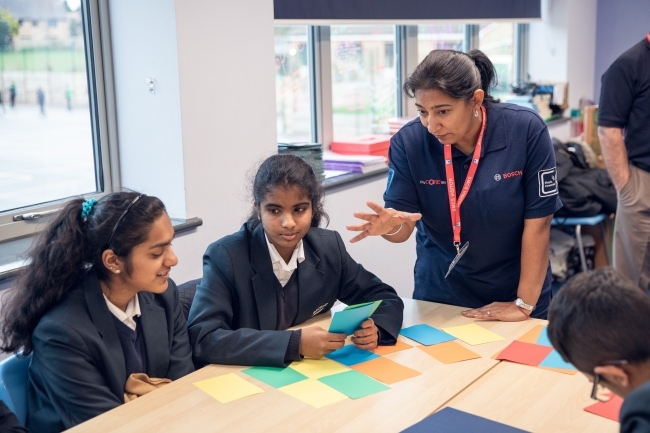 Bosch’s STEM ambassadors provided mentoring support to the students throughout the day to help teams develop their ideas. The Ambassadors also shared their experiences in STEM and advice for starting a career, giving students an insight into all the different routes you can take into a career in STEM. Monika Grosch, Careers and Work Related Learning Coordinator at St. Michael’s Catholic School, said: “We saw really fantastic engagement [with the challenge], the students were very active in participating. The Smart Future Challenge stands out because it involves every student, even those who don’t see themselves as strong in STEM subjects. I think that’s very important. Engineers need creative skills too and this project really shows that, as well as giving students the chance to work on solutions to real world problems.